Ten years after the first printing, and having been printed 28 times and published in 48 countries, this extraordinary true story, and important historical document, is delivered in shades of darkness and light; joy and sorrow, hope and promise. In 2000, Fumiko Ishioka, a teacher at the Holocaust Centre in Tokyo set out on a journey to find out about Hana Brady, whose suitcase was sent to Japan for use in an exhibition about the Holocaust. 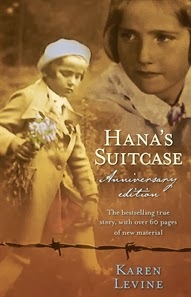 At that time Hana was only a name on a suitcase; one of the countless suitcases found at the Auschwitz death camp. Fumiko was the leader of ‘Small Wings’ a group of children who worked on newsletters to promote ‘the understanding of the history of the Holocaust’ among young Japanese children, and ‘to fight against racism, intolerance, and create peace by their own hands’- a project that continues to this day. With great persistence, incredible detective work, and undeterred by dead ends, Fumiko pieced together the jigsaw of Hana’s, and ultimately, her entire family’s life. She discovered that Hana’s brother George, survived their deportation to Theresienstadt - the Terezin Ghetto where Czechoslovakian Jews were sent. The account of his discovery in Canada, and his contribution to Hana’s story, is part of the 70 pages of new material that is included in this edition. Made up of parallel stories in differing time sequences, the book includes personal stories from surviving people who knew the Bradys, moving letters and poems from around the world by children that have read Hana’s story and became inspired by it, or had life-changing experiences due to its content. There are also projects for children to undertake connected to Hana’s story.